Robbi and I are continuing to work hard preparing for the start of this year's Aroma Tours adventures which begin this May with our delightful gourmet pilgrimage Flavours of Spain. As always, we greatly enjoy sharing in the excitement and anticipation of our guests as we draw closer to the beginning of our journeys together and we feel truly blessed to be able to share our passion for the places and experiences that we love with wonderful people from around the world, almost half of whom are joining us once again. This year is now our most successful tour season ever and Robbi and I hope that you will be able to join us. The tradition of making balsamic vinegar began almost 900 years ago in the winemaking regions around the town of Modena in northern Italy. Unlike normal vinegar which is made from fermented grapes, balsamic vinegar is produced by boiling down the juice of freshly pressed white Trebbiano grapes to form a dark syrup. The heating process also kills any yeast present which would tend to produce alcohol rather than vinegar. 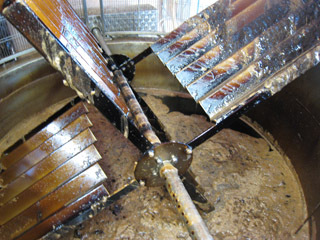 The concentrated syrup is then inoculated with a "mother" culture of acid forming bacteria which are responsible for the transformation of the sweet grape syrup into vinegar. Next comes the very lengthy and carefully controlled process of aging, which involves placing the inoculated syrup into a series of smaller and smaller oak barrels [chestnut, cherry, ash, mulberry, and juniper woods may also be used], that are left open to the air. The barrels are traditionally kept in the warm attics of barns which facilitate evaporation of moisture and concentration of flavour. As the aging process continues, the wood of the barrels gradually adds character and complexity to the vinegar which also becomes thicker as it slowly evaporates. After aging in this way for 12 years, the vinegar acquires a compelling depth of flavour, subtle acidity and loads of character and is allowed to be placed in the distinctive globe shaped bottle of the Modena Balsamico Consorzio and sold as as Aceto Balsamico Tradizionale. The next quality of balsamic vinegar is achieved after 25 years and yields the astonishingly textured and deeply flavourful, Aceto Balsamico Tradizionale Extravecchio. This balsamico is so fine that it can be sipped just like a digestive and has a sweet, velvety richness that fills your mouth with delight. 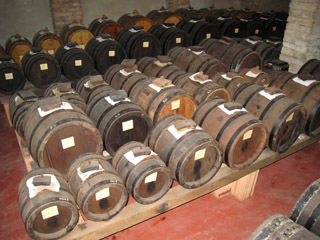 We were also lucky enough to taste 50 year old balsamic vinegar - ambrosia! During our Flavours of Italy Tour each year we visit a small, authentic acetia on the outskirts of Modena to meet the man behind the vinegar and his dog Maximo and most importantly to experience the true tradition of balsamic vinegar making and of course taste the difference! There are many products calling themselves balsamic vinegar in our stores that are little more than cheap industrial vinegar to which has been added colouring and caramel flavour and put into an interesting looking bottle. 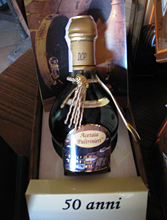 If you would like to try genuine balsamic vinegar ( aceto balsamico tradizionale ) made in Modena using this traditional method, remember to look for the globe shaped bottle with the designated "DOP" label ( denominazione di origine controllata ). Robbi and I are thrilled to announce that our Aroma Tours are continuing to flourish and we have now once again achieved our best ever tour season. Now that it is March, it is time for us to start finalizing our 2015 bookings, starting with Spain which is closing tomorrow ( 24th March ), followed by our French tours in the next week or so. Bookings for Aromas of Tuscany, Flavours of Italy and our Bali Women's Retreat will remain open for the moment or until they are filled. Robbi and I are looking forward to welcoming the last few Aroma Travellers for this year's adventures during the next short while. This year will be the final time that we will be offering our Flavours of Dordogne Tour and the current itinerary of our Provence Lavender Tour. If either of these tours are of specific interest to you, we invite you to join us for this one last time. Bookings for our 2016 season are now officially open and going wonderfully well thanks to more and more of our guests ( mainly return travellers and their friends ) making there plans well ahead of time. The Story of Champagne continues: Part 1 can be found in our previous newsletter. During Louis XV's reign, all wine was transported ( and taxed ) in wooden casks, however, for champagne this was a disaster, as it would quickly lose all of its effervescence through the porous wood of the casks. As a result, the Champenoise petitioned Louis XV to allow them to transport champagne by the bottle. After lengthy negotiations, which included standardizing the shape and capacity of the bottles to be used, Louis agreed to allow champagne ( and only champagne ) to be transported and taxed by the bottle. 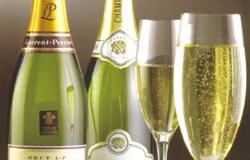 As Louis himself acknowledged - "People who like champagne want it to have bubbles". The increasingly frivolous and arrogant nature of Louis' royal court, while good for champagne consumption and the Champenois, was inevitably leading to more and more resentment and hardships for the French people. Criticism was not tolerated and the combination of a disastrous seven year war with Britain, loss of colonies, increased taxes and food prices added to the misery. After Louis' death in 1774 from smallpox, the even more frivolous Louis XVI came to the throne, and matters went from bad to worse. The onset of the American war of independence in 1776 lead to a British blockade of all shipping, which had a dramatic effect on champagne sales and the availability of goods from the colonies. Over the following years, these factors coupled with a series of extremely hot summers and very poor crop yields, stretched France to breaking point. In 1789, with the price of wheat and bread soaring to their highest levels ever, Queen Mary-Antoinette uttered the famous and fateful "Let them eat cake" and shortly thereafter the French Revolution and "Reign of Terror" began. After the demise of the Bourbon dynasty, France was plunged into a period of political, social and religious turmoil and in one 18 month period, 50,000 people died at the hands of the new revolutionary council. These were very dangerous times for the Champenoise and they went to extreme lengths to hide their associations with nobles and other persons from the former regime. With the founding of the First Republic the privileged status of the Church was abolished and its holdings were sold off to bolster the new nation's shaky finances. In Champagne, most of the best vineyards belonged to the Church and were now being broken down into smaller parcels to be sold to citizen vignerons, many of whom had little or no experience in the cultivation and care of vines. There was however one exception: the monastery of Hautvillers where Dom Perignon had once worked. Approximately fifteen years earlier, the young Napoleon Bonaparte was sent from the sunny vineyards of his family home in Corsica to Champagne and the Royal Military Academy in Brienne. In the beginning, he hated this new cold land, far from the sun and warmth of the Mediterranean. However, as time passed he increasingly found solace amongst the vines of Champagne which reminded him of the joys of his youth. Eventually, Napoleon settled down and became deeply attached to his new home and later referred to Brienne as "my native land." It was during this time that Napoleon was introduced to the young Jean-Remy Moet, grandson of Claude Moet, who had popularized sparkling champagne at the royal court in Versailles. As a result of this chance meeting, they formed a life-long friendship which ultimately led to Napoleon becoming a champion of champagne and being responsible for putting it firmly on the international stage. Before each of his military campaigns Napoleon always made a point of passing through Epernay and visiting Jean-Remy to pick up a supply of champagne. "In victory you deserve it, in defeat you need it." Only once did he fail to follow this ritual: on his way to Waterloo! With Napoleon's abdication in March 1814, the countries he had once conquered or fought against, instigated crushing fines and requisitions against France. As a result, cellars throughout Champagne were plundered, the worst hit being those of Moet, who saw 600,000 bottles emptied by the occupying Russian army. Before long, however, the leaders of many of these countries were trooping through the cellars of Champagne tasting and buying, including Czar Alexander of Russia, Franz II of Austria, King Frederick William III of Prussia, Price William of Orange and England's Duke of Wellington. Jean-Remy Moet now found that he had become "the most famous winemaker in the world", supplying champagne to every court in Europe. As the French proverb says: "Qui a bu, boira" - he who has drunk, will drink again. During the 1850's and 60's France's Second Republic under Napoleon III was swept up in the Industrial Revolution and underwent an era of unprecedented growth. Trains now provided rapid and reliable transport, Baron Haussmann was transforming slum-ridden Paris into a grand metropolis with wide boulevards and gracious buildings, and French industry grew to become greater than all of the other countries in continental Europe combined. It was also an era of unprecedented growth for Champagne, with machines taking over many of the repetitive tasks, such as bottle washing and corking and as a result, champagne production was transformed from a cottage industry into big business. Where there had been only ten champagne houses at the turn of the century there were now three hundred and annual sales of champagne skyrocketed from a few hundred thousand bottles, to over twenty five million! During this same period, Louis Pasteur uncovered the secret of fermentation, Jean-Baptiste Francois invented the sucreoenometre ( to gauge sugar content ), Adolphe Jacquesson developed the wire muzzle to hold down corks and Nicole-Barbe Clicquot-Ponsardin finally resolved the problem of removing cloudiness from champagne without loosing its' effervescence. Although hardly more than 5 feet tall and widowed at age twenty three with a young child, Nicole-Barbe single-handedly transformed the ruins of her husband's business Clicquot et Fils ( mainly finance and wool broking, with a little champagne production on the side ), into one of the world's most famous and successful champagne houses: Veuve Clicquot-Ponsardin ( "veuve" means widow in French ). Her innovation, known as "remuage" involved storing each bottle in an inverted position, with periodic shaking and turning, so that the sediment ( dead yeast ) would gather in the bottle's neck where it could later be easily removed. The Champenoise were now "standing on top of golden hours" and as one reviewer put it: champagne is not a wine, it is the wine!" As always if you have any questions or if you would like us to assist you personally with advice about your travel arrangemeAs always if you have any questions or if you would like us to assist you personally with advice about your travel arrangements or with any other details please contact us either by email at info@aroma-tours.com or by phone on +61 3 5331 3254 ( afternoon/evening USA time zones, mornings from other countries ).